For years, the primary metrics for whether or not any business was healthy were financial ones. To a large extent, this hasn’t changed in the eyes of executives and senior leaders — although it’s beginning to, and fast. 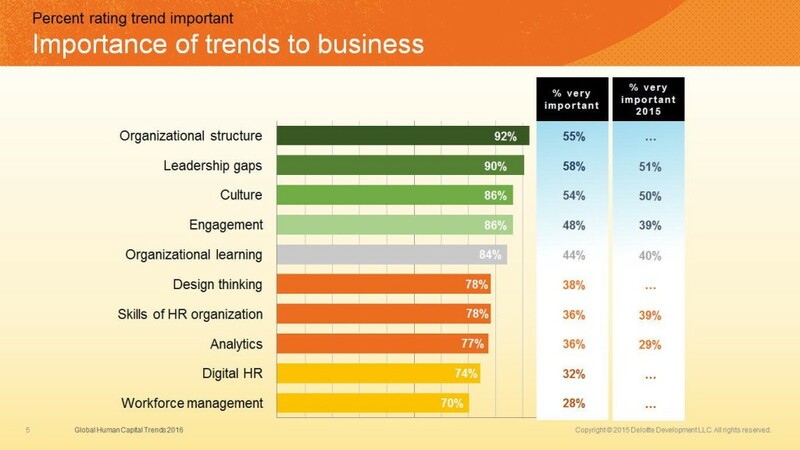 Some of the largest concerns were around structure, leadership gaps, culture, and engagement. All of these areas are subsets of organizational health. Sometimes it’s easier to see that pattern when you think of it this way: you go to a doctor every year, right? (Or at least you hopefully do.) You see your dentist every 6-12 months probably too. The same level of maintenance and tracking needs to be applied to your business. You absolutely need to be evaluating your organizational health every year. If you don’t, the problems that exist in Year 1 will only get significantly worse by Year 5 if left unaddressed. Those problems, whatever they may be, will likely cost you resources, especially good people. One of the truest maxims in business is that good people want to work in healthy organizations with other good people; they’re usually the first to abandon a sinking ship. So now that you know you need to be evaluating the health of your organization every year, you’re probably thinking “sure, but how?”. Good news, we’ve created the perfect tool for you to use! We’ve worked with hundreds of leaders over decades, and in so doing, we’ve put together a 10-point organizational health checklist. If you have questions about your specific business model, market, plan, or approach, reach out to us. We’d love to help! Caveat: no one gets amazing scores in all 10 categories. Even the best places to work — think Google, which has been on all those types of lists for over a decade — have flaws and don’t align in all areas. Running an organization of any size is hard. Our goal is to help you make it easier. We do need to begin with a financial metric, of course. To extend that doctor analogy above, a lack of profitability is akin to a person bleeding. After a while, the chances for survival decrease pretty rapidly. There are businesses that capture attention because of growth and don’t really make a profit — Amazon is the most notable example — but in general, profitability is crucial. To rank yourself in this area, you need to know a few things. First of all, what’s your current profit? Is it increasing or decreasing relative to the year before or the quarters before? To really understand where you lie in terms of profitability, you also need an understanding of the benchmark data in your industry. Industries can vary widely in terms of how much profit the top companies are capturing. You need to know the ranges in your specific industry. Many organizations track this via CAGR, or compound annual growth rate — although there are other metrics and approaches. Revenue growth is another long-held financial metric that showcases both your stability and future potential. Again, like profitability, it’s important that you do this against your market or industry — so having that context and ability to benchmark is important. If your revenue growth rate is 7%, that might seem excellent to you on surface. If you find out your competitors are 3%, you’d be ecstatic. But if your competitors are 27%? You’d be defeated. It’s all about context, because financial metrics can’t be analyzed in a vacuum. Now we get into the sections where many senior leaders have a tendency to get confused. Take a deep breath before this next sentence. Customer satisfaction and experience metrics are actually more important than profits and revenue growth. (Keep breathing.) One easy explanation for that? Famed management consultant Peter Drucker once explained it perfectly: profits are never the goal of an organization. Profits are what happens when you serve the customer properly. Most organizations do customer satisfaction metrics through surveys, which is fine and often very reliable. However, the crucial aspect of customer satisfaction survey work is that it needs to be done through an independent third party. If you do it internally, a ton of bias is going to creep in and your numbers might not be real. We’ve seen this at companies for years. Customers are the lifeblood of any business, regardless of what you sell or to whom. You need to always be aware of how your customers are perceiving what you do; that’s a crucial component of organizational health. This one is hard. Most organizations operate according to “what’s measured is what matters,” and culture is admittedly hard to measure. Many senior leaders think ‘culture’ is the same thing as your core values/mission statement list, but that misses the point. A “culture” is how your organization works together every day. Do people like being at work? Are managers respectful? Is it a place only focused on hitting goals, or are there aspects of fun and personal development along the way? All these things matter, but they are hard to measure. Here’s the secondary bias tier that many people forget: at the most senior levels of an organization, you tend to be furthest from the customers — but closest to the perks and benefits (higher salary, client dinners, etc.) You also are working with people who (typically) have years of experience in the same field you do, and oftentimes you’ve been colleagues for years too. From a loftier perch, how you perceive the culture may be very different than the day-to-day non-managerial employees. Oftentimes leaders will say “We have a great culture,” but they don’t know what it’s like down the ranks. “Culture” is often about talking to people and seeing where things stand and where they can get better. It’s less about tracking five elements on a spreadsheet. The “why” is your philosophy, mantra, or organizational purpose. This is where the emotional charge and passion of your people ultimately must come from. The “what” is your strategies and goals. These are the steps you take to achieve the “why.” Many companies are not very good at aligning the “why” and the “what” — even some super high-growth companies. The “how” is the road map. You must begin with the “why,” then move to “what.” Once you know the strategies and goals to get you towards your purpose, you can enact the “how,” or the road map. It’s a very clear flow, although it gets muddied in many organizations. Just like with customer satisfaction work above, it’s good to have a third party work with you on strategic planning. It reduces potential internal bias, brings in new perspectives, and helps creativity. This is an important component of organizational health, but often overlooked by those with the most responsibility. One of the reasons that internal challenges have become so prevalent is messy team architecture. Per that same Bain research, companies that get to $5 billion valuations typically have 9-14 layers between the customer and the top decision-makers. That’s a lot of potential bureaucracy. At the same time, clear job role — knowing how your “what” and “how” align with the company’s “why” — is one of the single-biggest predictors of happiness and productivity at work. You need to get team architecture right. It will vary by the type of org you want and the industry you’re in, but it needs to be a focal point. Innovation is a critical factor for future success. Now, it’s important to remember that your entire team won’t be innovative. You will see articles sometimes that claim you need an entire team of Steve Jobs-type individuals. That’s not possible. But you should still track how many innovations your company has had in the past 6-12 months, and you should regularly conduct organic discussions with different levels of employees about how open managers are to new ideas. Oftentimes, managers are not the best judges of new ideas — and as a result, they can swat down potentially-great ones. Reversing that type of culture is crucial to innovation, which is why it must be evaluated in the context of organizational health. When you do acquisitions right on a regular basis, it allows your company to enter new markets, consolidate existing ones, add new offers, obtain new talent, and explore different cultural offerings. In short, it helps the DNA of your organization to get a regular refresh. It also allows the company to grow faster than it would organically. Acquisitions have been all the rage in the tech space for years, for example — within a few weeks of writing this, Microsoft purchased LinkedIn and Verizon purchased Yahoo. You need to evaluate two things when it comes to acquisitions: (a) how many you’ve had in the past year and (b) how good your process for investigating and deciding on potential acquisitions is. (B) might be more important than (A), because if your process for investigating an acquisition is flawed, the number of acquisitions doesn’t matter as much — many will likely be flawed. Teams form because they need one another. If you could do it alone, then you would. However, people can’t do it all alone. To get people to go above and beyond, then a reward system that shares the wealth optimizes performance and results. How great is your reward system? Do you have powerful positive incentives for your leaders, your team and your allies? How much better would your results be if incentives and results were aligned? There is one crucial caveat to thinking about your rewards structure: oftentimes, organizations focus on rewards for the top people only. This is logical in the sense that they have the most responsibility, but illogical in the sense that their compensation and bonus packages are already strong relative to other employees. his is ** the ** big one, but again … it can be hard to measure and, as a result, many organizations gloss it over. Really be serious about this. Are you doing what you are here on planet Earth to do? Life is short, and if you’re not in alignment with your purpose, then it’s time to find another game to play that is. Research shows that you’ll be more successful, happier, prosperous and even healthier if you do! “Purpose” in a work context is a hard topic, because some believe the goal of an organization isn’t to provide purpose to employees. (Legally, that’s true.) But if you want a productive, goal-oriented business that grows and makes you money, purpose is the cornerstone of all that. Without employees feeling purpose and connection between strategy and day-to-day work, there will be lots of manifested problems, turnover, and lost revenue opportunities. Everything begins with purpose and passion for the ‘game’ your company is playing, whether that’s widgets, hospital equipment, steak knives, or an app. Based on recent research from Bain and Company, 94% of business development challenges that companies face are now internal. That’s a huge shift from even 15-20 years ago, when most business development challenges were external — i.e. needing new technology, supply chain, etc. What are these internal challenges representing 94% of the business development roadblocks? Most are among the issues discussed above: culture, senior leadership buy-in, communication, filtering of information, and the like. In short: if you have poor organizational health, you likely have limited opportunities for business development. You should assess that ASAP. And now, you can start right here!